A mysterious missile launch off the southern California coast was caught by CBS affiliate KCBS's cameras Monday night, and officials are staying tight-lipped over the nature of the projectile. Scroll down for KFMB video showing the launch. 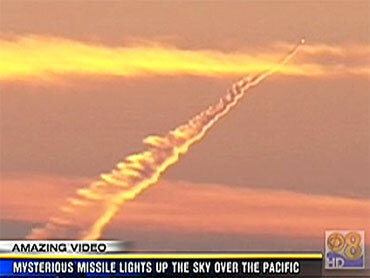 A Navy spokesperson told KFMB it wasn't their missile. He said there was no Navy activity reported in the area Monday evening. "It could be a test-firing of an intercontinental ballistic missile from a submarine … to demonstrate, mainly to Asia, that we can do that," speculated Ellsworth. Ellsworth said such tests were carried out in the Atlantic to demonstrate America's power to the Soviets, when there was a Soviet Union, but he doesn't believe an ICBM has previously been tested by the U.S. over the Pacific.